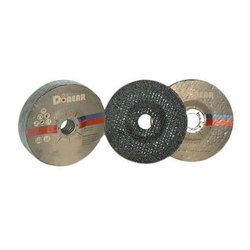 Leading Manufacturer of metal grinding wheel from Delhi. Appreciated for its optimum metal grinding efficiency, the Metal Grinding Wheel is rendered in various varied specifications. Used for metal grinding applications, the quality of the metal grinding wheel is always maintained. For fabrication of metal grinding wheel in accordance to the industry norms, we make use of modern machinery and technology.